Fresh Coat of Paint: Do You Have (Or Would You Ever Get) a Tattoo? Do You Have (Or Would You Ever Get) a Tattoo? Would you ever get a tattoo? Do you have one already? What is it? I'd love to know! Corey's always wanted a tattoo but I've been talking him out of it for years because it seems so... rebellious! I've never really been a (visible) tattoo girl... probably because I'm too chicken! I often admire them on other people though. I remember back in high school when a couple of my friends turned sixteen and got their bellybuttons pierced. I thought they looked so cool! Then I remember some of my friends getting tiny studs in their noses and again, I thought it was such a feminine and delicate look! Still, I refrained from getting any tattoos or piercings of my own because my "good-girl" inner voice would shout things at me like: "But what if people think you're wild or not smart... or not serious enough?" or "People won't take you as seriously and they may not respect you as much." or, (My personal fave) "People associate those things with drug culture. Do you really want people to think you're on drugs?" I am laughing at myself as I type this but those are the real things I have told myself each time I thought about getting a little tattoo to commemorate a special milestone or life event. But by now I know all those things I told myself in the past are rubbish. I know who I am; I am proud of my values and my work speaks for itself. 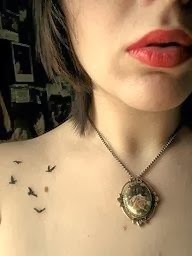 Tattoos have also become much more mainstream and accepted in recent years, which makes it a little easier to give myself permission to get one. I finally feel like I'm in a position where if I wanted to get a little "ink" I could... Which is a bit of a milestone in itself, isn't it? It's so nice to finally feel that I don't need to pigeonhole myself into choosing a specific outward look just because it "matches" how I feel inside. As many of you know, Corey and I are art lovers and we often follow new-ish artists and fill our home with art that we love. The closer we get to our wedding, the more I've been thinking that it would be fun to do something wild and unexpected together and we've been toying with the idea of getting matching tattoos... perhaps something creative and unique. Think of it as a little pre-wedding bucket list item. And it's not just my mother who may feel compelled to call me to weigh in. Tattoos are often perceived with some controversy by many people. While we're only contemplating this permanent form of body art, we have definitely considered the "What will people think?" factor. In the end, we've decided that we're really not very concerned with what other people will think and have chosen discreet locations so that we can cover them very easily. We've also agreed (it's a miracle!) on a design and artist in case the mood should strike us one day. This is exactly the kind of planned spontaneity that we like and it's kind of exciting to have it all planned and yet not know for sure if we'll ever feel the urge to actually go through with it. We're sort of saving it as something that may or may not happen one day (on a rare occasion when neither of us is working) and it's fun to think that we could just wake up, look at each other and say "Let's get tattoos today!" I'm secretly hoping we'll end up doing it. Can you tell? Corey and I are usually pretty conservative so it would make us feel kind of wild to do something so off the beaten path! These birds look so delicate! 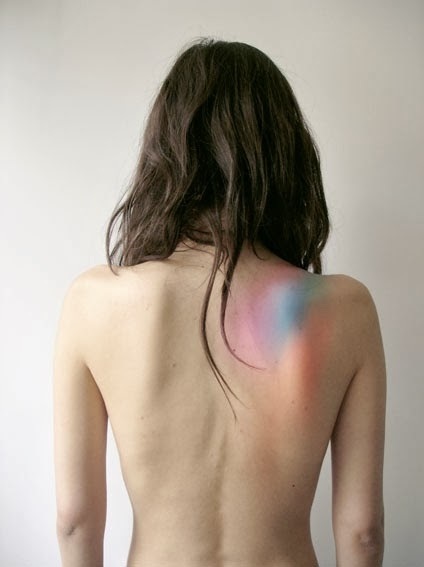 I have never seen anything like this rainbow tattoo! I think it would be neat for one person to get a geometric prism tattoo and the other member of the couple to get this as a coordinating piece! I tend to think feathers are overdone, but these are so wispy and light that they look like they could actually float away! I love simple designs made up of shapes and lines in black or grey. 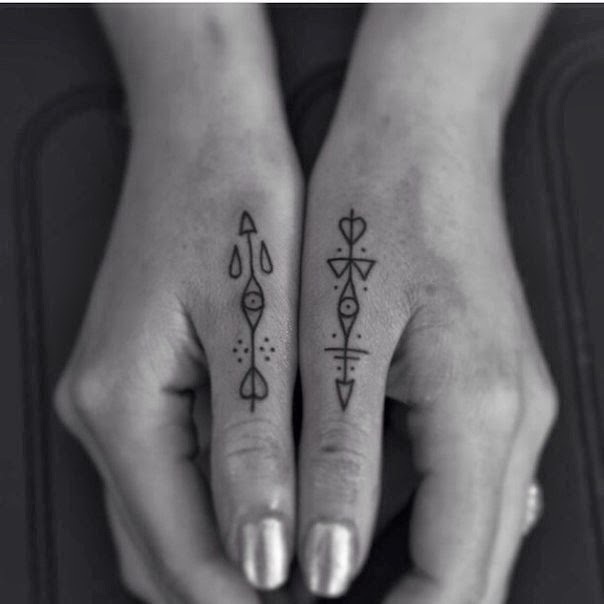 Not only do I love the simplicity of this geometric tattoo but I love the way it plays with colour saturation. 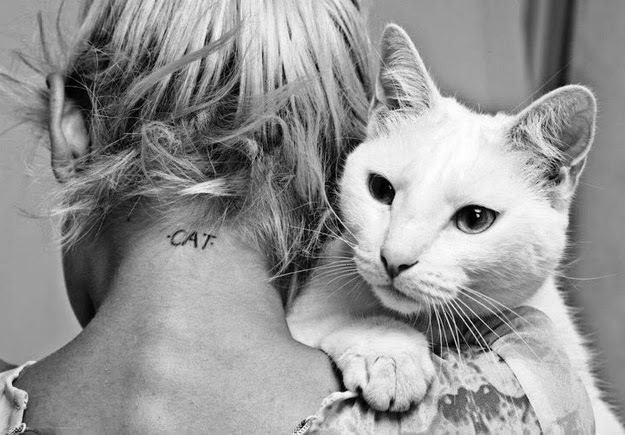 The placement of this tiny tattoo makes me smile... as does the kitty! This white lace tattoo is so delicate that it almost looks like jewelry. 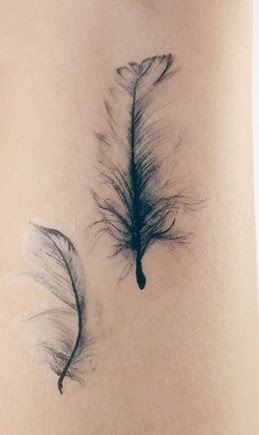 I love this idea but I don't quite trust the white ink because it fades on many people. White ink tattoos are trendy right now and they can be subtle and stunning, but many artists refuse to do them because they can be so unpredictable. 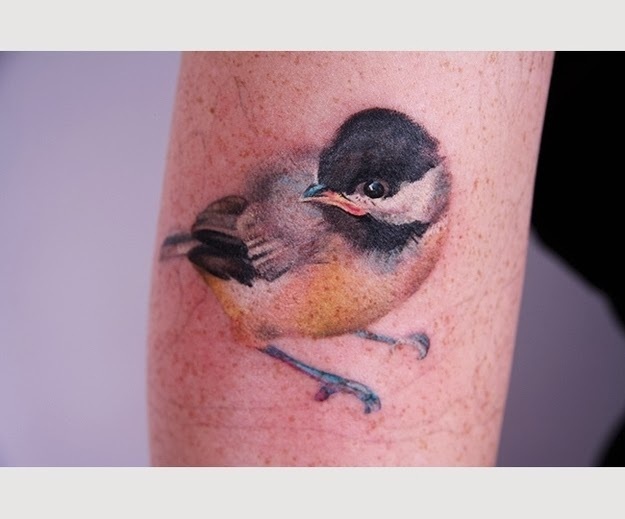 This sweet little bird looks like it stepped out from the pages of a story book! I love the shading on this flower! It almost looks like a black and white photograph. 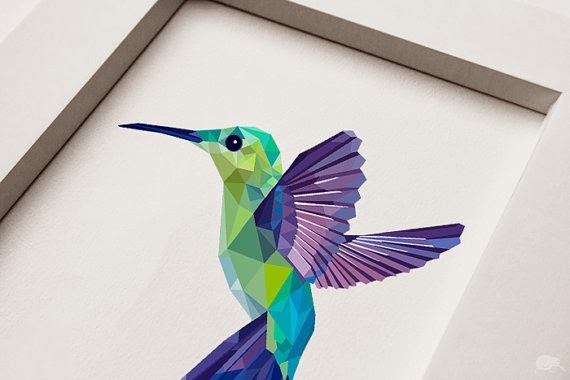 This isn't a tattoo but I love the combination of colour, geometry and nature in this hummingbird print! Wouldn't it make a pretty tattoo? I've always wondered if I missed the boat (so to speak) on some of these rebellious milestones but now I think it's never too late. 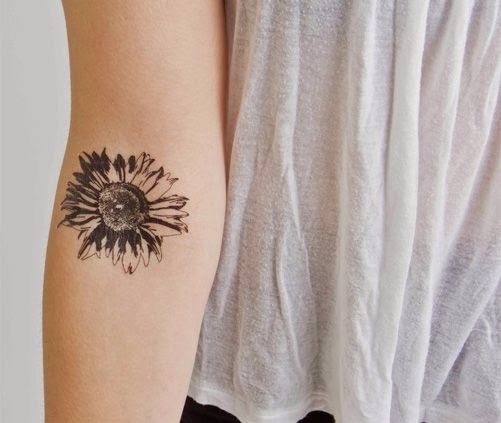 Would you ever consider getting a tattoo as a (no-longer-young) adult? I can tell you that even just giving ourselves permission to do it has spiced life up a bit- Both as individuals and as a couple! Would you ever give yourself permission to do something just a teensy bit crazy? What Does the Fox (Mask) Say?